We honor the memories of the victims of September 11, 2001, and commend the valiant efforts of all involved in the rescue and recovery response. We pay special tribute to the men and women of the FDNY, NYPD, PAPD and FDNY-EMS who in the course of saving so many lives, made the ultimate sacrifice. You will never be forgotten. 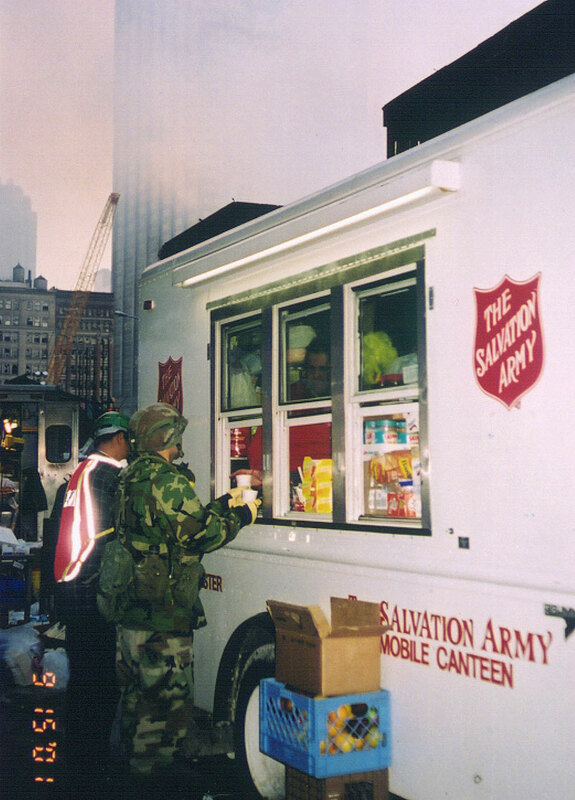 On the afternoon of September 11, 2001 Westchester County New York REACT (WCR) received a request from the Salvation Army in New York City to remain on standby to assist them in their response efforts. 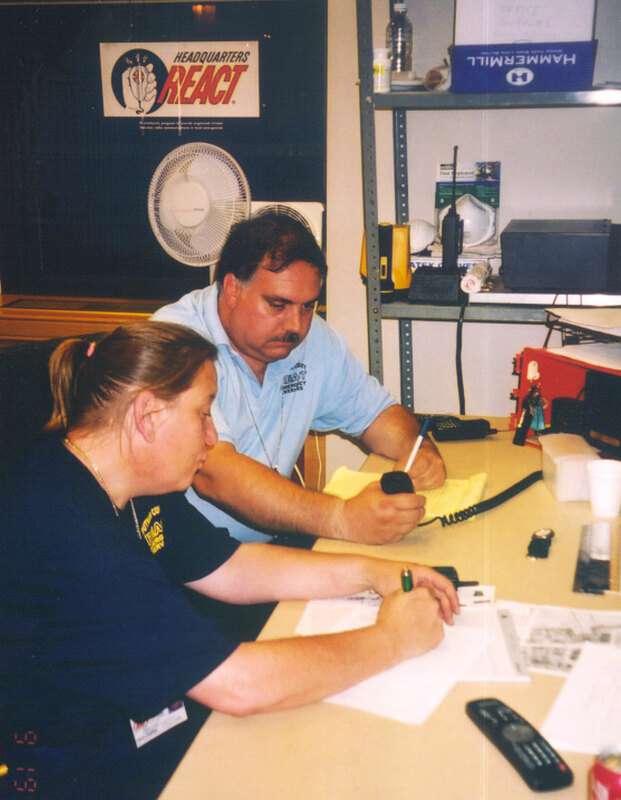 The following day WCR was asked to begin sending personnel to provide emergency communications and to transport Salvation Army staff and supplies into and out of Ground Zero. Over the course of the following days and weeks, numerous REACT teams from the tri-state New York area and other parts of the country coordinated together to provide assistance to the Salvation Army. Our members performed mobile and foot patrols of all of the Salvation Army canteen trucks stationed throughout the city, relaying back to Salvation Army headquarters the status of supply inventories and special requests made by canteen staff. The operation remained in effect 24 hours a day for several weeks. This operation was a success thanks to the support of REACT International and REACT teams from many parts of the country. The following memoir is from Clark Bortree, the first REACT member to respond to the Salvation Army’s request for assistance on September 12. 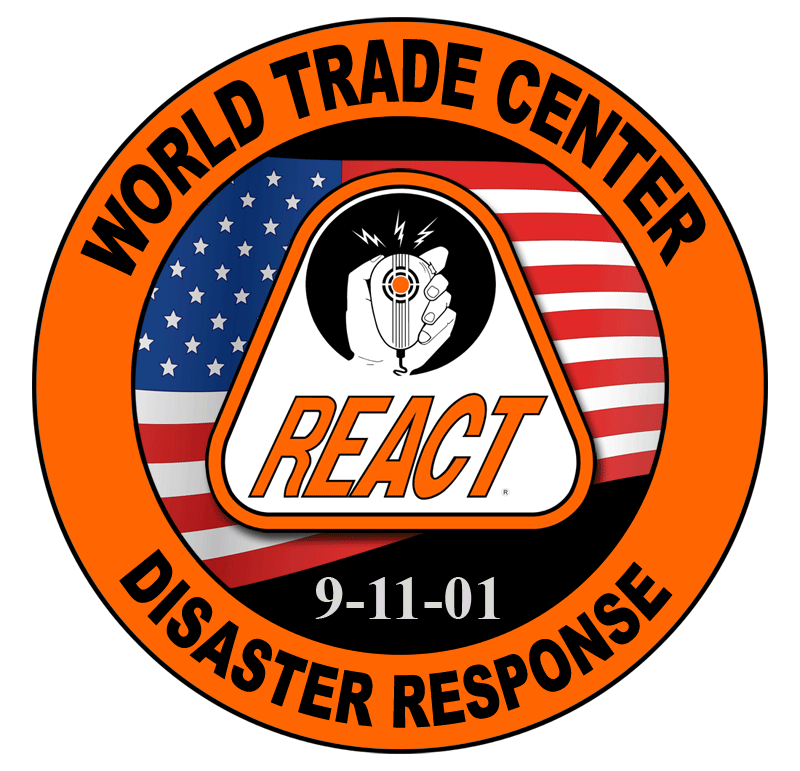 Immediately following the collapse of the Twin Towers, I called the president of my REACT team and asked him what if anything we might do to respond to the situation. He told me that he had just received a request from the Salvation Army in NYC to place our team on standby to assist them. Because of the chaos that day, nothing had been determined regarding how our team could respond. The next day, 9/12, the president of our team called me and told me to report to the Salvation Army’s HQ on 14th Street where I would receive my assignment from the Salvation Army’s emergency radio communications division (SATERN). That afternoon I headed down into the city on the west side highway. As I approached 57th Street coming off the highway there was a military checkpoint stopping and inspecting all cars. Non-emergency vehicles were diverted onto 57th Street. I got by after showing my ID and explaining where I was going. On the way down to 14th Street, I had to stop at multiple police checkpoints and get cleared to continue on. Once I got to Salvation Army HQ, there was some confusion as to how to coordinate the massive volunteer response. The coordinator told me that what they needed most from REACT members at that time was to have as many of the canteens (food and supplies trucks) as possible assigned a radio operator . The NEXTEL phones, which were the main method of communications, were working intermittently. So, I took my first assignment and headed toward the Medical Examiner’s office on the east side of Manhattan at 32nd Street and 1st Avenue. Upon arriving at the M.E.’s office I began relaying information back and forth between the canteens stationed there and headquarters. All the while, there was a steady stream of tractor trailers lining up to unload bodies from the WTC site. It was at that point that the severity of the disaster started to sink in. I remained as focused as possible on the job at hand of relaying radio communications. Several hours later as early evening approached, I ended up becoming mobile and transported some of the canteen volunteers back to Salvation Army HQ. While back at headquarters an urgent request for gasoline from the canteens in Ground Zero and at the Javitz Center came in. I was the only mobile unit (person with a car) available and took the call. There were a few challenges to carrying out the gas delivery assignment, the first being locating gas canisters. After consulting with some police officers at one of the checkpoints, I made my way over to the main emergency equipment and gasoline distribution center set up just north of Ground Zero by the river. 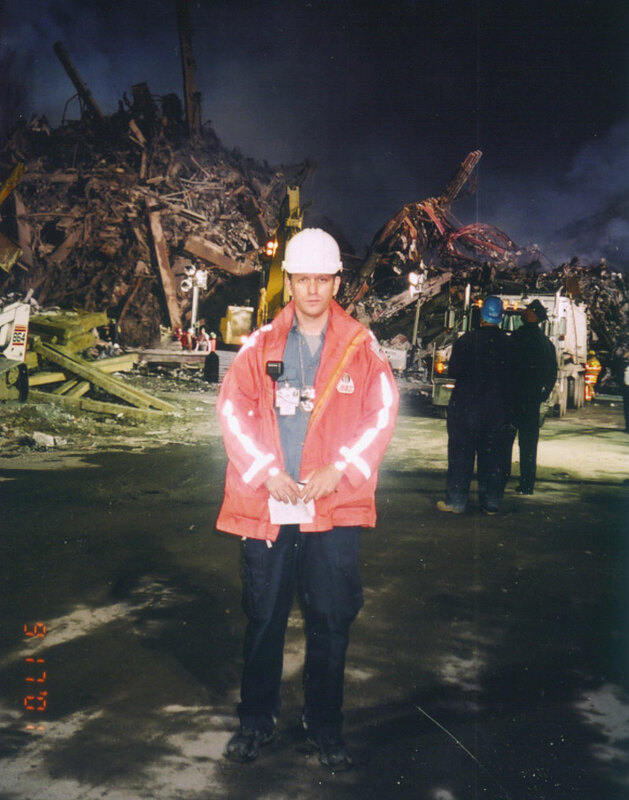 Once there, I loaded several full canisters of gasoline into the back seat of my car and then headed toward Ground Zero looking for the first two canteens on my assignment. As I got closer to Ground Zero there were more police checkpoints to pass through. Navigating the streets which were littered with building debris and civilian and emergency vehicles destroyed in the collapse of the towers was challenging. The whole area was pitch black due to the power outage, and one-way streets became two-way streets. As I neared the first two canteens, the air became quite thick with a white foggy type of mist. It was a mixture of smoke from the fires burning and the building materials of what was once the Twin Towers. Everyone in the area was wearing gas masks and hard hats. Upon arriving at the location of the first two canteens, one block north of the collapse site, I was given a mask by the Salvation Army staff and we began fueling up the trucks. Having filled up the tank of the first canteen and most of the tank of the second one, I headed back uptown to refill the gas canisters and then proceed onto the canteens in need at the Javitz Center. I had to return to Ground Zero once again with more gas for the second canteen which had not been completely fueled up on the first try. It was about 5:00AM when my assignment was finally done. I signed off with the Salvation Army radio base and began to head home. Once completely out of Ground Zero, I was overwhelmed with the sense of having just awoken from a horrible, surreal dream. Paradoxically, I felt a sense of accomplishment having helped in the little way I could, despite the scale of the catastrophe. For the next 10 nights I’d be back working on the overnight shift. The following day, 9/13, REACT members from all over the New York area as well as representatives from REACT International started coming in and putting in many hours. It was tough to keep the radio base and mobile operations going on a 24 hour basis but somehow we did it. As the days passed, our members become a familiar sight among the police at the check points leading into Ground Zero and were often greeted with smiles and kind words as they passed through. Toward the end of the second week, just when the members from the local teams were finding it more difficult to put in long hours due to work responsibilities, we saw the arrival of members from a Missouri REACT team who drove all the way in. This group of wonderful people helped keep the operations going strong for another two weeks. After a month, Salvation Army HQ advised us that they would be able to manage full operations with their own staff and equipment and thanked us for all of our assistance. There is so much more to write about what I saw, felt and experienced during those first 10 nights in and around Ground Zero. But, I think it best to summarize it in as short and a concise way as possible. There are three memories from the rescue/recovery effort, especially that first night on 9/12, that will remain with me for as long as I live. The first being that of thousands upon thousands of office documents falling from the sky and landing everywhere in trees, on the sidewalks and in the streets. These faxes, memos, photos and spreadsheets represented to me the thousands of innocent civilians killed in the attack. The second memory is that of the dozens of emergency vehicles burned out and crushed, parked exactly where they were when they arrived on the scene. These vehicles represent to me the hundreds of selfless emergency personnel and first responders who made the ultimate sacrifice while saving others. The last memory is that of the thousands of people from all walks of life who participated in the rescue/recovery effort. They represent to me the most important reason why we are here on earth: to come to the rescue of those in need without regard to one’s ethnicity or nationality. My heart goes out to all those who lost family members, friends, co-workers and associates on September 11, 2001. I hope that your favorite memories of the ones you’ve lost remain in your heart and give you comfort and strength each day forward.